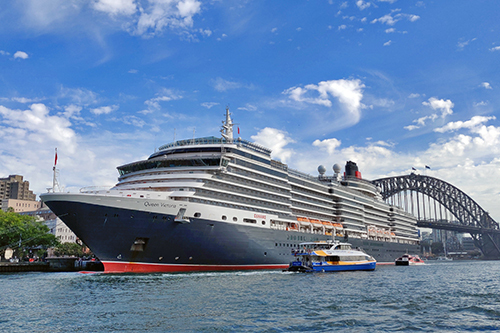 The OPT is accessible from the time a ship is scheduled to arrive until the scheduled departure time. A drop off/pick up zone is available at George Street. Parking is not available at the OPT. Taxis can drop off passengers at the terminal entrance where there is a dedicated taxi rank. 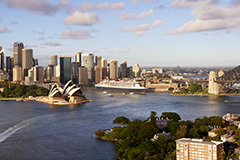 Circular Quay station and bus stops are only a few minutes’ walk away (450 meters). Passengers arriving from a cruise will reclaim their luggage and clear Customs, Immigration and Quarantine inside the OPT before exiting the terminal. 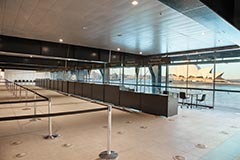 A taxi rank is located on level three of the OPT which has a dedicated area for picking up cruise passengers. Passengers departing for cruises should refer to their itinerary for check-in times at the OPT. Bag drop facilities are available prior to check-in on cruise days and is located adjacent to the terminal entrance. Please check with your cruise line for operating times. Entry to the terminal is available only to travelling passengers with valid tickets. On entry guests will be navigated to the dedicated check-in hall via either lifts or escalators to the mezzanine level of the building. Once checked-in, you will go up to Level Three of the OPT where you will have room to sit before being processed by Customs and Immigration and undergo a security screening. A Tourist Refund Scheme (TRS) desk is available for passengers leaving on international cruises. TRS enables you to claim a refund for the Goods and Services Tax (GST) and Wine Equalisation Tax (WET) that you paid on goods purchased in Australia. You can claim the TRS from Customs at embarkation after you have checked in. International Cruise Voyages – You will need your individual passport with a validity of at least six months and be required to complete an outbound passenger card as well as a health questionnaire. Domestic Cruise Voyages – You will need a government agency issued photo ID (driver's licence, etc) and be required to complete a health questionnaire. 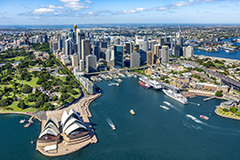 International cruises will be greeted by friendly Sydney Destination Ambassadors who can provide directions, sightseeing and public transport information. Duty free facilities are not available in the terminal though purchases can be made on-board the cruise ship. ATM’s, foreign exchange, cafés and restaurants are all within short walking distance of the terminal. Prior to leaving for the cruise terminal it is recommended you contact your cruise line or travel agent to reconfirm your itinerary and specific requirements and exclusions that relate to your voyage.